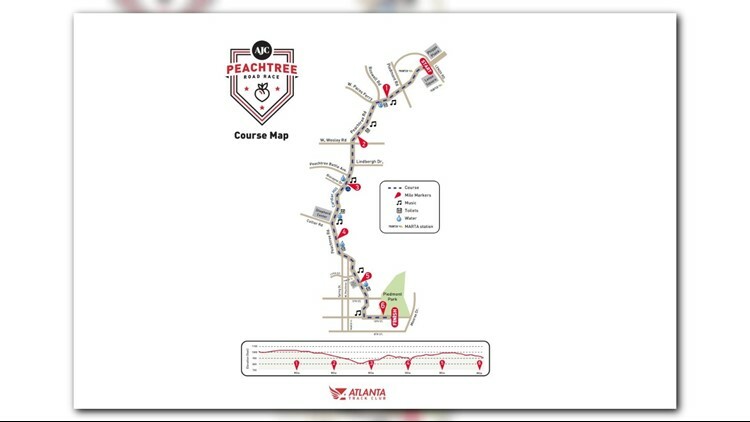 ATLANTA -- Law enforcement officers in Atlanta are taking safety precautions as they prepare for the large crowd of runners and spectators who will attend the AJC Peachtree Road Race on the 4th of July. A thwarted terrorist attack in Cleveland has counter-terrorism experts here on high alert. Authorities said an American citizen allegedly planned to bomb the July 4th parade there, but the FBI says it stopped him before he could even start his plan. Experts here are weighing in on their preparations for the race. The FBI in Atlanta says there is no credible threat against the 4th of July parade here, but they're still on the lookout for any potential attacks. They say they're coordinating with APD and Homeland Security to make sure the event is safe. The Department of Homeland Security says 4th of July festivities are potentially vulnerable targets, so they pay a lot more attention to them. Police said they plan for every possible outcome and make sure their officers are prepared. There are a number of events they have to watch that day -- fireworks, a parade, and the AJC Peachtree Road Race. Police are already patrolling the route. Atlanta Track Club says safety comes before everything. They started planning security with APD July 5th of last year and say those conversations continue throughout the year. About 15,000 cameras will be watching the 60,000 runners and 200,000 spectators in real time. In addition, MARTA Police will be monitoring the See Something, Say Something app closely. If you're headed to the event, you either need to carry a clear bag, or no bag at all -- security will make you bring it back to your car if you try and bring it in. Georgia Bureau of Investigation said bomb disposal unit is working with the APD Bomb Squad Independence Day events throughout Atlanta, including the Peachtree Road Race. APD official said they are working closely with all of these agencies and others to make sure runners and spectators are safe along the route. "We constantly study events that occur, not only in the U.S. but throughout the world, and try to learn from them so our security plans are always up-to-date," said Carlos Campos, Director of APD's Public Affairs Unit. "You will see lots of police presence all day Wednesday at the road race and other events, such as fireworks shows." APD is urging anyone who sees anything suspicious, call 911. Get more general information about the race here.